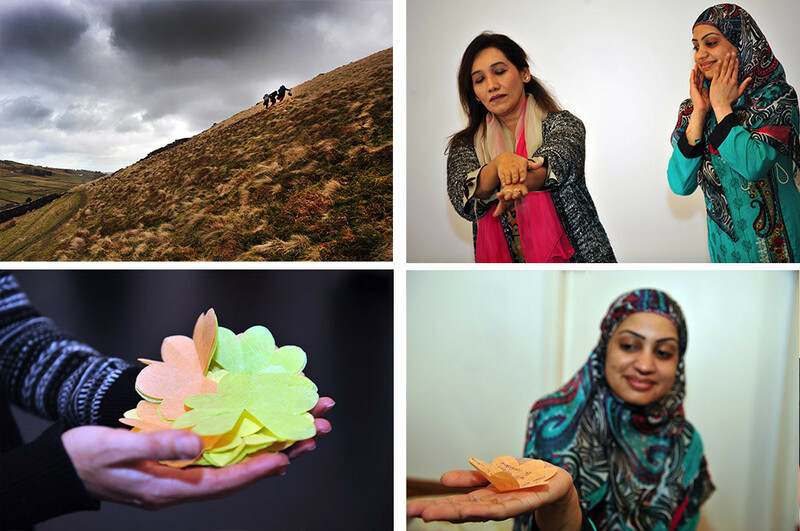 In 2014 verd de gris were commissioned by Calderdale Adult Health & Social Care to develop a pilot project looking at new ways to engage with young women from the Muslim community in Halifax. The aim was to understand more about factors impacting on mental health and ‘well-being’ in this group of women recently arrived from their homeland in Pakistan. As always, the creative arts proved to be a fantastic tool to help these women articulate feelings and open up about what were the important issues affecting their quality of life. We worked with Surraya Bibi and Halifax Opportunities Trust to recruit a number younger and middle-aged women: to learn more about their circumstances, home life, cultural traditions; to develop activities that would help boost confidence and self-esteem and offered coping mechanisms to help them in their daily lives. As part of the project we led creative sessions with children from Savile Park Primary – 4 x young women came into the schools as volunteers to work with us, taking part in activities with the children, advising and supporting the children in their work. 3 of the women have also taken part in verd de gris’ creative dementia training – a big factor being that they came away from the ‘safety’ of their community in Halifax and Park Ward to attend sessions. 3 of these women went on to become regular volunteers on weekly dementia sessions in Savile Park, Halifax (working predominately with older British White people). 20 of the women came with us to a local primary school – the boost to their confidence and self-esteem was tangible. They took part in activities, worked with the children, read their work out loud! Because we included creative / meditative activities in our sessions, many of the women are now using these as calming techniques to help them when they get anxious or feel unable to cope with things during their day. One woman has picked up the importance of ‘voicing’ her experiences and now keeps an active journal, writing every day to help her come to terms with a loss. As part of the project we took the group up to Whitestone Arts, near Haworth … for a creative retreat day. This proved to be a hugely important and liberating event for the women, allowing them time and space to ‘re-connect’ with the landscape … to feel the ground beneath their feet. This exercise proved the importance of cultural factors in well-being – these women had not left the urban streets of Halifax since arriving from Pakistan and felt deeply the loss of connection to ‘homeland’. So why is there such silence in my heart? Oh heart, why do you no longer have the desires of the world? Oh I can’t find the words I so wish to express. Will life continue this way? How will i ever overcome the everlasting pain? Oh shores of the rivers, can I not come under your wing too. On Tuesday 10th March 2015 we brought all the project participants together – the school children, the women and their families (with a host of invited guests and local dignitaries). 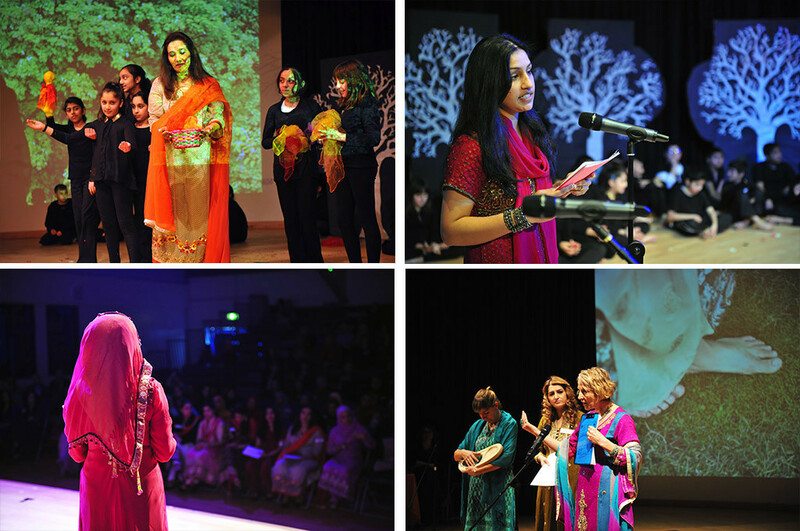 We crafted an event that showcased all the wonderful things the women has achieved. It proved to be a marvellous and seminal event … a real game-changer for us and for the women from this Muslim community in West Yorkshire. “So, what has it all been about? At first none of us knew either. It seemed really strange how art work was going to help us. In what way & why? I feel being part of this project has reminded me of what it feels like to smile again & to be happy. Sharon made me realise how good my poetry was & encouraged me to write. I haven’t stopped writing since. This is really helping me to let go of my pain. Many times the pain became stronger but this time I have courage and strength to cope with the pain. This is something I learned on the project. Before, I accepted the way things were in my life but now I have the desire to live and be happy. This has been the best journey of my life. We have had so much fun, l can’t remember the last time I laughed so much. They were tears too. Lots of tears!. Every session was so enjoyable. I will miss all these moments where we made friends, listened to each others feelings. Natalie & Sharon have beautiful hearts and they made us feel beautiful. We know how much work they have all done in making our lives more happy.